The central program goal is to foster a more permissive and accepting environment for VPs implementation projects in Ghana. To achieve this goal, the project has four main objectives: 1. Establish sustained multi-stakeholder dialogue with respect to security and human rights; 2. Build capacity of local civil society groups; 3. Increase public education and understanding of human rights, security, corruption, gender, and violence issues; and 4. Contribute to the overall learning and development of best practice in creating an inclusive, multi-stakeholder VPs in-country process. The Voluntary Principles on Security & Human Rights (VPs) have become a widely-recognized industry standard for oil, gas, and mining companies to better ensure the human rights of communities affected by their operations around the world, particularly in relation to the provision of security. The VPs go beyond being simply a statement of commonly accepted standards – both the document itself, as well as the plethora of guidance that has been produced in relation to it, recommends extensive multi-stakeholder engagement to ensure that the VPs are successfully implemented. Though implementation of the VPs is, first and foremost, the responsibility of the oil, gas, and mining companies themselves, the participation of “home” and “host” governments, as well as civil society from within the country and abroad, is important in fomenting the conditions that encourage and facilitate effective implementation. With the government of Ghana announcing in 2014 that it would sign onto the VPs initiative as the first African nation to do so, it is now in the stages developing a VPs National Action Plan. Working with the U.S. Department of State’s Bureau for Democracy, Rights and Labor, The Fund For Peace (FFP) in partnership with the West African Network for Peace Building (WANEP-Ghana), will lead a program which supports these VPs implementation efforts across Ghana. Throughout this program, FFP and WANEP-Ghana will engage closely with CSOs, companies and the government, to ensure the project activities are effective and can remain sustainable. Our program aims to act as a pilot which will spur a highly successful and robust implementation of the VPs in Ghana, led through the government’s National Action Plan, as well as ongoing civil society dialogue and constructive company engagement. 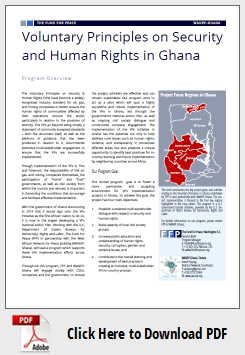 The implementation of the VPs initiative in Ghana has the potential not only to help address core issues such as human rights, violence, and transparency in extractives affected areas, but also presents a unique opportunity to identify best practices for in-country learning and future implementation by neighboring countries across Africa. 4. Contribute to the overall learning and development of best practice in creating an inclusive, multi-stakeholder VPs in-country process. Provide local targeted trainings to the four local communities. The trainings will focus on VPs awareness and building the capacity of civil society members to monitor conflict within their communities. Based on a needs assessment of the particular community, training will also involve topics such as peace education and non-violence, grievance mechanisms transparency and governance, and media. Facilitate local multi-stakeholder dialogue platforms for community members and CSOs to discuss VPs related conflict drivers, deploy a grievance response mechanism where necessary to resolve issues, and document findings which can be used for further constructive dialogue with companies, government and other civil society stakeholders. Facilitate a national multi-stakeholder roundtable to bring together the three pillars of government, civil society and company stakeholders in a working group environment to constructively discuss and resolve VPs related issues. Deliver a VPs awareness campaign focusing on educating the general public through online media, in tandem with targeted local communications to the four key regions of the project.